The public debate about the proliferation of tech shuttles, and the fees they should pay to use Muni stops, has thus far been driven more by emotion than by data and empirical analysis. But two city planning researchers at UC Berkeley are looking to change that by studying crowdsourced videos of private shuttles in bus zones, which they’ll use to gauge the delays they impose on Muni. The $1 fee that the SFMTA will charge shuttles every time they use a Muni stop, as part of a recently-approved pilot program, has outraged gentrification protesters who view private transit as a cause of skyrocketing rents and evictions. They want higher fees. But the fee is limited by state law to an amount that recovers the costs of administering the program, and $1 is what the SFMTA has estimated to be the cost of enforcement and permitting. 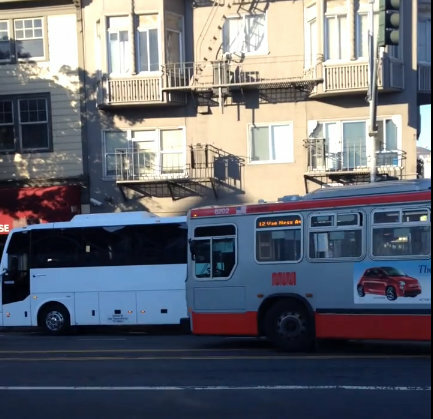 By amassing videos of shuttle stops, Cal researchers Mark Dreger and Dan Howard think they can demonstrate the costs of Muni delays due to shuttles blocking stops while loading. “We would like to find out what it really costs to provide this service, and no data exists to set a precedent for a fair market price for the use of these stops,” Dreger and Howard wrote on a Facebook page about the study, which includes instructions on submitting a video. Of course, as we’ve written, Muni and private shuttles — which make it easier for commuters not to own and drive cars — wouldn’t be fighting for scraps of curb space if the SFMTA re-purposed more parking spaces for transit stops. The SFMTA has implemented a few of those in a pilot, but it’s not a widespread practice yet. There’s no doubt, though, that data on the quickly-growing private shuttle industry is lacking, and solid empirical evidence is key to good policy decisions. Maybe these videos will help make the case that more curb space should be devoted to private transit boarding. “It’s worth trying to find out whether the shuttles — or any other private vehicles — are causing Muni delays, and to remedy it,” said Livable City Executive Director Tom Radulovich. One useful stat on private transit is the finding from two other UC Berkeley researchers in a separate study [PDF], which found that without the employee shuttles serving tech companies in San Mateo and Santa Clara counties, 48 percent of their users would drive alone, another 18 percent would take Caltrain, and 15 percent would carpool. So they certainly take a lot of cars off the road and open up seats on public transit. People railing on the shuttles have held up, as a smoking gun, the finding that 40 percent would move closer to their job. But even if you believe that efficient transportation which enables people to live in walkable SF is a bad thing, this figure means that without the shuttles, most riders would stay put, and of those, half would drive alone to work instead — hardly a net benefit in terms of traffic and congestion. And while the focus has remained on the Silicon Valley shuttles, the SFMTA recently reported that 80 percent of private shuttle stops in SF are for trips that stay within the city. That, more than anything, seems to indicate the need for better Muni service and safer streets for bicycling. Post by SF Shuttle Study. Again some of the residents will say that they already paid for their on street parking with their taxes and registration fees. Without price as a signal people tend to over-consume (e.g. parking) which leads to negative consequences. With shuttles being free, employees can maximize their benefits by moving to SF instead of living, say, Sunnyvale where they will have to pay for their own transportation even though it is far lower and have less social and environmental consequences. Can people who choose to live closer get a shuttle cash out? If everything about getting “top talent” is so important that they can say screw you to the poor and elderly folks that are being priced out of SF, then what’s the difference between Google and Exxon Mobil. At least with Exxon Mobil it is easier to hold them accountable. Another possibility is to limit shuttle pick ups only at 5th & Powell, Transbay, Candlestick, and Daly City BART, and have Muni provide additional feeder service. This would at least limit the housing impact since it would require some kind of transfer. Right, but you are asking some specific segment of society to limit their impact on some other specific segment of society, without any real proof that there is a direct impact. Furthermore, there is another segment of society (rich people or drivers), that are not asked to mitigate whatever impact they have. In a complex world and economy, this is absolutely delusional. If you want to be limiting displacement, create a social safety net and create very specific tax policies that favor the elderly, the low income and transit riders. Then their relative advantage in regards to housing will increase, and the relative advantage of the young, the rich or drivers will decrease. But Mario – now you are talking about taxing Andy instead of taxing Google, and that’s just wrong. Pointing at shuttle users who work in tech, vs. all the other upper middle class and wealthy people who pay for afford expensive housing is just scapegoating. Taxes to pay for more transit service and subsidized housing, plus flat out more housing is what’s needed. Create a terminal for google, paid by google. Passengers can take public or taxi to the location, or from it to work. Andareed, I think it’s taking democracy a little too far if the voters are asked to decide what fees the city charges for this, that and the other. Especially in this case where it is an emotive issue and a determination of the actual costs of the shuttles using Muni stops should be a rational and empirical exercise. The agreement is temporary and a pilot. Let’s see what we learn from that and then make an intelligent decision going forward. Because we really should be taking land we could use for housing and make a bus depot that is used a small part of the day. make it the transbay center and have google pitch in on getting it done on time and under budget. Andy, how do you ‘over-consume’ a carpool? Free car storage != free use of a road to get from point A to point B.
Oh BTW, you might want to check with these evil companies first before assuming these shuttle rides can come and go like a simple perk. I believe all these companies were pressed upon by the respective city councils + BAAQMD to provide the shuttles because they’ve run out of parking and 101 is too damn congested. So Google compares with Exxon Mobil now, huh. One company gets employees out of cars and is trying to invent technology to reduce our dependence on oil; the other, is oil. Yeah man, I was totally thinking the same thing. This would accomplish exactly nothing. Nothing good, anyway. Instead, prices of housing in proximity to 101 & 280 would still stay as high as they have been, people would buy more cars, traffic en route to onramps would be at an *absolute standstill* every single weekday, real estate prices within 1.5 miles of the terminal would explode, and tens of thousands of person-years would be flushed down the toilet because everyone needs to commute anyway and now they’ll just sit in their cars instead of working on the bus. Why can’t anyone remember back to the first dot-com boom? Put it at the transit hub designed to be near where people from outside SF work, instead of near where people in SF live. I see. 2 things, one, since you’re so worried about under using land, if they build a station elsewhere make it multiuse. Housing or google offices above a shuttle hub (obvi). And second, the transbay terminal is going to be a huge transit hub so it is a great choice as it’s the spot that the most people are going to be able to access (also obvi). Raise RPP before you mess w/ this. Oh, non-starter? Of course, cars uber alles in CA. The problem is that SF is not able to plan for this surge of employees living in the city but work somewhere else based on the agreement between the companies and their cities. Why don’t these companies based in SF if their workers so wanted to live in SF? at least SF can plan for this and even paying taxes to SF. It just seems like cities like Mountain View and Sunnyvale see the additional demand for housing like garbage and would rather have Google truck and dump them in SF, basically telling SF: Well since you like high density then you should figure out how to house them, if poor folks get displaced then tell them to move to Richmond or Vallejo. So what’s Google’s solution to the affordable housing problem? None! Problem doesn’t exist! Exxon Mobil’s solution to the climate crisis? None! Problem doesn’t exist! Then what’s your solution to the crisis? If tech folks are willing to pay top dollars to displace poor folks in SF, where should the poor folks stay? If they have to live in Richmond or Vallejo, then what’s your solution to make sure that can have easy access to medical and other essential services as well as healthy foods. Why not create a Googler/Facebooker housing society and have you guys donate a part of your excess salary to subsidize housing for the poor/elderly/disabled. Mega commuter fee. Free based on length of car or bus commute in excess of some minimum distance using FasTrak. Scale with income, so not regressive. Use the money to fund Complete Streets improvements, so people will have a nice place to live near their work, instead of feeling the need to live two hours away. The peninsula has one of the highest concentrations of mega commuters in the country, who clog more roads and produce more pollution than everyone else. If you are contributing more to the problem, then you need to contribute more to the solution. Seattle and the DC area have been doing more to build housing, and their prices haven’t been spiking as badly. Mayor Lee called for an initiative to build 30,000 units – I don’t know whether it will work, but that’s the right direction. On the Peninsula, tech workers who live in the cities (or who’d want to live there and commute less) should show up at City Council meetings – the debate is skewed toward older homeowners who don’t want more housing and fear more density. On the Peninsula, renters form a large portion of the electorate, but vote in much smaller numbers. Renters are getting displaced by the price spikes. If techies showed up, renters showed up and voted, the decisions would be different. Why Google and Facebook? Why not everyone who can afford it? There are some technical challenges in paying for subsidized housing – redevelopment went away, which was a major funding source – and development impact fees are facing legal challenges. There was a bill to bolster impact fees that the Gov vetoed last year. You are missing the whole point of a shuttle. A shuttle picks people up at or near there homes. when you call an airport shuttle, you don’t expect to be told to go to TransBay to pick it up. If you were, you’d just drive. And the point of shuttles is to stop people driving. It seems to me that some people are interested in finding a better way for these shuttles to do what they are doing. While others just want them to go away, for primarily non-transit reasons. I have no time for the latter. Maybe the cost structure can be improved. Maybe a slightly smaller vehicle might prove more appropriate. But making people trek to some downtown location north when they actually want to go sough makes no sense. Andy, tech workers are not displacing anyone. They are merely buying or renting vacant units in an area where they want to live. This is a transit issue. Making it a housing issue or, worse, a class warfare issue, will help nobody. Let’s put it this way. The shuttle riders are now concentrated in large part in Noe/Castro/Bernal/Mission. A J-Church MUNI ride to the Transbay Terminal will take longer than driving all the way to Mountain View from Noe Valley. Non-starter. And then you get to run those buses out of the most congested part of San Francisco, further extending the time of the trip. The Transbay Terminal is most accessible from the East Bay. Perhaps that is why it’s called the “Transbay” terminal. But you still didn’t address the idea of transit hubs in other areas that are multi use. They could even have bike lockers for people who are outside of walking distance and can’t take Muni (heaven forbid!). It would also allow companies to build more housing for workers since Mt. View and other silicon valley cities don’t seem very interested. I’m not saying this is a silver bullet, but the idea of hubs, even if it’s just a bigger curb cut or loading zone, makes a lot of sense as a useful compromise. One note on selection bias – since this keeps coming up. The crowdsourced data (which we are supplementing with our own data collection) is simply used to determine average dwell times of shuttle buses, not the probability that Muni and shuttles will overlap. We will run this against Muni’s and the shuttle’s schedules to determine the probability that a Muni bus will encounter a shuttle. As such, even if we get more videos of shuttles actively blocking Muni than of shuttles stopping when there is no Muni around, we are only counting dwell time. (By the way, most videos we have thus far are of shuttles stopping when there is no Muni vehicle around.) If you are concerned about us having a representative sample of Muni/shuttle interactions, feel free to go out and record the sort of behavior you think we’re missing. Also, yes – the delays to Muni from double-parked cars, Lyft/Uber/taxis in bus stops, traffic, etc. are probably much greater than these shuttles. And yes – the shuttles take a certain number of single-occupant cars off the road. We’re not contesting that. For the purposes of this study though, due to time constraints and the fact that we are just two people, we are choosing to focus on the shuttles. As Dan mentioned the other day, we are most interested in honing in on the true market rate of street space – in this case, quantified in terms of delay to Muni. Once we have such an estimate, we hope to be able to apply this to the dwell time of other vehicles, including private autos, Lyft/Uber/taxis, etc. That would require additional observations of those vehicles’ average dwell time, but this study gets us closer to that point. Thanks for all the suggestions and comments, Streetsblog readers! I only wish SFGate’s commenters were so informed and polite. The shuttle riders continue to own and drive cars. They drive the cars to Noe Valley, park here – taking up parking space during the day, then take the shuttles. Get your facts straight. Thus the inexpensive real estate in Noe Valley where they don’t live, and the expensive real estate in the Outer Sunset where they do live! Why displace anyone? Just build more housing in San Francisco, then everyone can live here. Don’t want reality on camera? They handed one out to me, so the standards must not be that high! It would be easy to have zero conflicts with Muni vehicles if they just added a second bus zone wherever there’s a shuttle stop. What is the “true market rate” if those spots are just RPP? $0.30 per day is less than $1 per stop per day. For RPP spots, it seems clear that it’s a win for a 3 car-length area to be used for 10 to 100 residents riding a private shuttle each day than 3 to 9 residents parking a private car per day. In addition to delay from double-parked cars vs. loading shuttle, to be fair you’d also have to look at congestion delay from cars (high) vs. shuttles (low). Good point, & 3 RPP spots would be $1/day. I think white zoning next to Muni stops is the best short term solution. Mmmm, given that the reality is that cars and trucks park in Muni stops all day, every day? Then why the paranoia? I don’t understand.